Before e-mailing, please consult the forums for additional support. Don't throw out that old PC yet! A fine-tuned Windows XP PC can run quite fast even it's seriously lacking in the memory and CPU department. Before you chuck out your PC or even decide to upgrade, try stripping some of the rust that's built-up over the years; the results may surprise you. It's probably your operating system that's slow, not the PC. It's software, not hardware - you know, invisible 1s and 0s held in an electric field representing your data. Your computer is still fast, but there's a ton of stuff slowing it down. There's more 1s where there should be 0s and your PC is killing itself fighting an impossible battle to burn off this fat. We've seen Pentium II machines with 128 MB RAM run XP faster than Pentium IVs with 4x the clock speed and 4x the RAM - so what gives? This article will help you figure out why your PC is running slow and outline exact steps to fix it quickly, before throwing in the towel with a format, restore, or new PC purchase. Before you dive into your PC, it is absolutely critical that you determine what is slowing it down. Ignoring a bad hard drive could lead to catastrophic damage with data loss. Lack of sufficient RAM completely limits a PC's performance. Spyware and malware could be having a circus inside your OS - just like in 90%+ of other PCs online. There are other causes for PCs to run slow, but these are the most common. The basic symptoms of a bad hard drive are: extremely slow performance, blue screen of death error screens, system errors on startup, and strange sounds coming from your PC, especially clicking sounds. If you suspect your drive is failing, shut down your PC as soon as possible. Download Hitachi's DFT, burn a CD to test your drive, boot off it, and run a scan to determine if it's defective. If you use a bad hard drive for too long you might suffer complete data loss. It's possible your PC doesn't have enough RAM. The amount of RAM your PC has can be checked by hitting the Windows and Pause/Break keys at the same time. The amount is listed toward the bottom right. The same information can be accessed by right-clicking My Computer and choosing Properties. We've seen Windows XP run with 64 MB RAM and it is not pretty. With 128 MB, an XP machine can survive basic tasks as long as there is not a lot loaded into memory. We consider 256 MB to be the absolute tolerable minimum. The jump to 512 MB will help speed up the PC considerably, especially if there is antivirus or anti-spyware software running in the background. Currently 1024 MB (or 1 gigabyte) seems to be the sweet spot, where adding more RAM doesn't seem to be cost effective for most users. However, gamers can usually benefit from the jump to 2 GB. RAM is cheap. Check your local retail ads for sales. Seriously consider upgrading if your PC has less than 512 MB. Instructions on installing RAM can be found here. Instructions are available for notebooks here. You might avoid spyware like a flagged minefield. But if kids, friends, or PC newbies are using your PC to browse the Internet it's verylikely that your PC is infected. The basic symptoms of spyware, malware, adware are: slow performance, pop-up ads, strange error messages, extra toolbars in your browser, frequent web browser crashes, and slow or completely non-functional Internet. Completely removing spyware can be a big job. If you're not up for it, you may want to pay a repair shop to complete the job for you. To remove spyware, here's our most recent guide. Our older guide is available here. If all of these other things are not the problem, your PC is probably just cluttered with crap and needs a tune-up. This article covers a quick (5-15 minute) tune-up for Windows XP. The basic approach: Visual effects, Add/Remove Programs, Startup folder, temp files, registry cleaning, CCleaner, services, then defragment. Shown below is the before and after CPU usage from a typical tune-up of this type. The PC tested here started with 42 processes using over 152 MB of memory. After the tune-up, this was dropped to 23 processes using only 63 MB of memory. To see your current CPU and memory usage, hit CTRL-ALT-DELETE and view the Performance tab. The number of processes is listed in the bottom-left corner. If you plan to use Common tasks (such as the built-in Windows Explorer CD Burning Utility, you may want to leave Use common tasks in folders enabled. Read through this list and determine what else you may want. Test the settings using the Apply button before deciding you're OK with changes. Turn off your background image and you'll notice the desktop comes up slightly faster. It also (depending on the detail of the image) will give you more free memory. This can be accessed by right clicking the Desktop, choosing Properties, Desktop, and looking under Background. Sure, it looks plain. But it helps a bit with resources. To further tweak the visual settings for maximum performance download Tweak UI. In general, the more programs you have installed, the more memory they are using. This isn't the case with all programs, but it's still good practice to remove programs you don't use. You'll save hard drive space and even system memory if the programs load at Windows startup. Enter the Control Panel (Start, Control Panel or Settings/Control Panel) and go to the Add/Remove Programs applet. The list of programs you'll see rarely contains anything essential to the PC's operation. Most of the programs were installed by a user and can be removed if they are not required - just don't remove Microsoft Office and so-on if you plan to use it. Go through this list and remove all the programs you're positive you don't use or need. Anything you're unsure of should be researched on Google before you uninstall it. The most common entries we uninstall are: AOL, AOL AntiSpyware, Yahoo Toolbar, Wintools, Viewpoint Media Player, Speedway, Weatherbug and various "Deals", which are almost always spyware. Additionally we'll remove programs installed for one-time use or that we thought we'd use but never did. If you don't use AOL feel free to remove any reference you see. Don't remove any drivers unless the hardware has been removed from the PC. If your antivirus or anti-spyware program are expired and out of date, you may as well uninstall them since they are taking tons of resources and newer, free alternatives are available online. Removing some items here will require a reboot. This may not be as much of a performance tune-up as it is a generally good practice to cover, especially since it'll free up some hard drive space. The best tool we've found to clean up temporary files and the registry is CCleaner (aka CrapCleaner). Overall this is one of the best tweaking programs out and can definitely help you easily fix issues with your system. Download and install this program, making sure not to turn on extra features you won't use like the Yahoo Toolbar it tries to install. Run the program and uncheck any specific items you don't want to remove. If you require it, go through the Advanced Options and check any entries that you require to fix issues with your PC (such as Window Size/Location if one is resized awkwardly). Then click Run Cleaner at the bottom right. After several seconds it should complete, giving a detailed report on resources recovered. In this case, 1.3 GB was recovered! CCleaner also has some other cool features. Click the Issues button on the left and it'll find problems in the Registry. It might be a good idea to quickly browse the list to determine what kind of problems were found. Backup the registry before running this tool (Start, Run, Regedit [HIT OK], File (at the top), Export [type name and Save]). Most of these can be fixed safely using the Fix Selected Issues button. Additionally the Tools tab can be used to uninstall more programs, delete broken uninstall links, and turn off additional Startup programs much like HiJackThis as mentioned in Step 3. Removing extra programs that run when Windows starts will greatly increase its performance. These programs usually load in the system tray at the bottom right, but sometimes you won't see the programs at all. Note that these programs typically do not need to run at startup to function! From the Start menu, choose All Programs, then right click Startup and choose Explore. Delete any repeat entries or shortcuts you are sure you can do without (we'd remove the stuff relating to Microsoft Office, Real Player, Quicktime, etc.). Very rarely do you need any startup shortcuts in this folder. Repeat the process using Explore All Users if you have multiple user accounts. 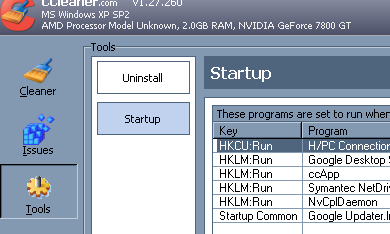 Now from CCleaner as mentioned above, navigate to the Tools option to the left, then click Startup. This tool cannot break your PC, but at worst limit its functionality. As long as you are only turning off startup programs here, your PC can recover from damn near anything you turn off. It may be a good idea to backup the registry (mentioned above) if you use this tool. The tool tells you where in the registry to find the keys that it's going to remove and the program path it executes. You may find lots of crap lurking here. We've startup programs in other tweak guides, but basically any 3rd party program can be removed from this list unless it involves an all-in-one printer or the PC is a notebook (in which case you'll want to keep support for the touchpad and power management). We recommend removing "Save", "Weather", "Deals", etc. as these are generally Ad-ware. Turn off anything relating to Real Player (keyword being "Real"), Quicktime (such as qttask), and findfast. There are online lists available detailing all the startup files such as this one. If you're scared to turn something off, check to confirm if it's required. Each program here is DIRECTLY RELATED to the system's performance, particularly its free memory and CPU. This program allows you to manually edit even more startup items including Toolbars, Browser Help Objects, and some Services. This program all but replaces HiJackThis and msconfig. Make sure to remove references to uninstalled programs or expired antivirus/anti-spyware applications. In Windows, common essential tasks run as "Services" under svchost.exe. These Services include such items as Windows Firewall, Windows Intaller, and various network support features. Most services supplied with Windows XP aren't required. However, some can be disabled to free up some resources. Some argue that disabling Services does not help system performance, but if 3rd party Services are enabled they sure can't help. The best way to turn off individual Services is to choose Start, Run, Services.msc [then hit OK]. Alternatively go to Start, Control Panel, Administrative Tools, Services. From here, double-click any Service you're positive you want to disable, perhaps Automatic Updates or Adobe LM Service. From the dropdown menu labled Startup Type choose Disabled. Stop the Service currently running using the Stop button. Normal services should be set as Automatic or Manual (with Start greyed out). So what Service should you disable? That's nearly impossible for us to answer. Generally you should be able to determine which Services you need. If you're unsure of a Service, check this article. If you're having problems fixing File and Print Sharing issues, make sure you check our article for the correct services to use. This would be a great time to clean-up some other key areas to the PC's response time and zippiness. I'd start by deleting extra icons and downloaded files on the Desktop (visible quickly by hitting the Windows and D keys simultaneously). Delete lots of stuff here! These icons may not seem significant but they're taking some memory. Also, navigating a cluttered desktop is damn near impossible. For now at least create subfolders such as Downloads, Text Documents, and so-on and store the majority of files in these. A clean desktop will probably increase your productivity even if it doesn't help the PC's performance much. This would also be a good time to clean up your Start menu. Open it up, find shortcuts that you don't use, right click the entries and choose Delete. You can also remove shortcuts to programs that you only run when you open a data file. For example, the shortcut to Quicktime is probably unnecessary, as you'll open this program automatically when clicking Quicktime movies. These steps take about 5-15 minutes to complete once you've learned the process. As a habit we tend to run basic tune-ups on just about every PC we touch and the results are always worthwhile. For additional tuning, start to defragment your hard drive (My Computer, right-click your C: hard drive, choose Properties, Tools, Defragment Now) before you go to bed one night as it may take a few hours to complete. Keep an eye on system resources (CTRL-ALT-DELETE) as you install new programs to determine if more tuning is necessary. Don't forget to update major system drivers (especially video, sound, and chipset) and run Windows Update regularly for new patches and fixes.